I think my wife, family and friends would all agree with me when I say that I’m a big child at heart. I still get very excited about those little things like receiving and opening gifts and parcels even though many of the parcels I have ordered myself on the internet via play.com or amazon.com. It brings me back to WYD 2000 in Rome when I received my Pilgrim pack, I was impressed! I had no idea that I was going to receive a bag pack full of goodies and knickknacks. 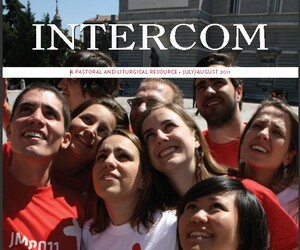 This years WYD 2011 pilgrim pack promises to be even more exciting with the inclusion of a special gift from Pope Benedict XVI, a copy of YouCat. YouCat stands for ‘Youth Catechism’, a catechism especially designed for young people, offering a contemporary explanation of the Catholic faith. I don’t think anybody could accuse me of exaggerating when I say that reading the catechism is something that we don’t associate with young people but then again how many of us have read rule books for different sports or hobbies that we play or support. I have attempted on more than one occasion to read the rule book of the GAA but have got bogged down and left it to a more opportune moment. Books like these are usually unattractive, comprehensive, wordy, complicated and functional. We trust that other people who have a more hands on administrative role will keep us informed or we can use Google or Wikipedia to find out something we need to know when we need to know it. However, how many of us are missing out on something by not taking time to read, study and contemplate these ourselves? ‘You need to know what you believe. You need to know your faith with that same precision with which an IT specialist knows the inner workings of a computer. You need to understand it like a good musician knows the piece he is playing. Yes, you need to be more deeply rooted in the faith than the generation of your parents so that you can engage the challenges and temptations of this time with strength and determination.’ Pope Benedict XVI. Following the publication of the Catechism of the Catholic Church in 1992, a number of young people requested something more adapted to them. The result is a book, in appearance and content, that is more accessible than the larger catechism. 4 How they should pray (prayer and spirituality). The questions are direct and honest, even at times tough, the answers straightforward, relevant and compelling. YouCat will likely become the ‘go-to’ place for young people to learn the truth about the Catholic faith. I really like the small quotes, scripture references and definitions in the margins and found them helpful to reinforce the answers and commentaries to the tougher questions. I also see it as a great resource for catechists working with young people. It should become the primary resource and foundation for catechesis in youth ministry up and down the country. The Pope displays great faith in young people when he says ‘Some people tell me that the youth of today are not interested in the catechism, but I do not believe this statement and I am certain that I am right. They are not as superficial as they are accused of being; young people want to know what life really is about.’ It is positive to see that discussions and posts regarding YouCat are already appearing on the internet especially on social networking sites such as facebook and Twitter. Although YouCat is not quite readily available there is a sense of anticipation and hope among young people and adults working with young people in ministry whether they are expert bloggers or novice posters. This is a wonderful gift from the Pope to young people. I hope, when they open the pilgrim bag pack with excitement and anticipation, that they will value this book as a genuine resource to help them develop their faith and relationship with Jesus.